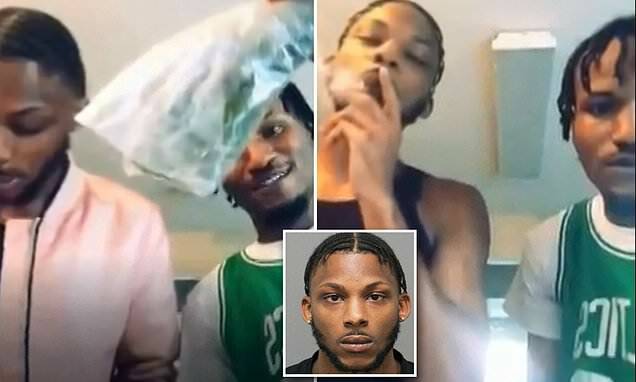 A North Carolina father and his friend have been arrested by police after they live-streamed themselves smoking cannabis while his son was in the room. Donta Dewayne Blue, 23, and 20-year-old Tyreek Jordan Carpenter were charged with misdemeanor child abuse after being arrested Sunday. Blue - who lives in Raleigh - acknowledges that he was smoking in front of his son for Wednesday's live-stream but admits that he wasn't aware of the boy being in the room at first. 'I mean I was smoking weed, I'm not going to lie,' he declared to CBS 17. 'We were on the live video and he was basically in the back of us.